When you’re swimming in the ocean, the last thing you might want to see is a 40 foot long, dark shadow lurking through the water. In the warm summer waters in places such as Mexico’s Isla Holbox, the Philippines’ Donsol Bay as well as in the Bay of La Paz in Baja California Sur (among other destinations) however, these shadows are a welcome sight. Swimming next to a whale shark is one of the most unique and electrifying experiences I’ve ever had. These massive polka-dotted creatures glide through tropical waters spend their days eating plankton and paying no mind to the fish nor—in the lucky case of for humans—people around them. 1. Whale sharks are big. Really, really big. I’d seen photos of whale sharks, with their enormous mouths—nearly five feet wide—filtering plankton, prior to diving into the water with them, but I didn’t understand their sheer size until I got up close and personal. The world’s largest fish can grow to 40 feet in length and weigh around 11 tons. That’s massive, especially when you measure in at only five-foot, three-inches. The sharks I swam with were young and still enormous at about 15 feet from mouth to tail. Their sheer size makes whale sharks imposing creatures, but their easy glide and demure demeanor makes it clear these giants are, indeed, gentle. 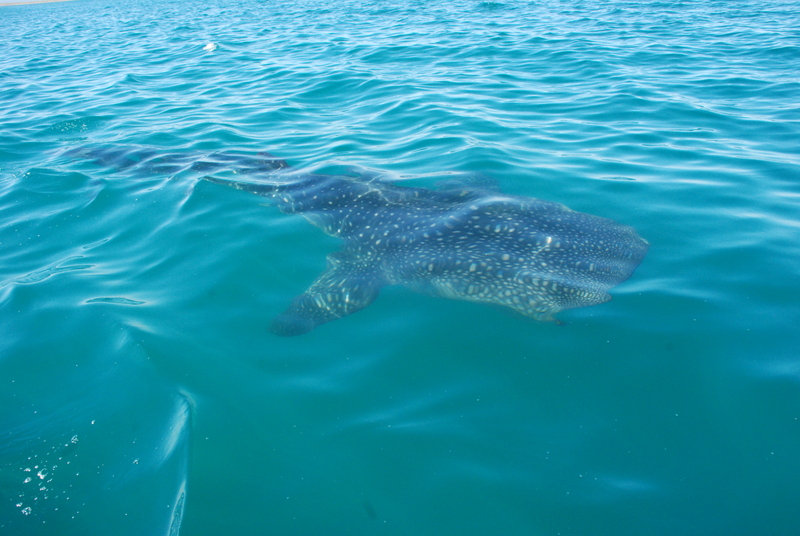 I floated along next to these beautiful polka-dotted creatures aware and fascinated by our incredible size disparity. 2. Look, but don’t touch. When my guide spotted a colossal shadow in the water, he nodded in my direction and we jumped in. Because whale sharks are wild animals and we were visiting their home, we stayed more than three feet away at all times. The fish are relatively slow movers, so it was easy to turn when they turned and slow when they slowed. And three feet was more than close enough to see the pattern of white dots speckling the whale shark’s back; this pattern of dots is unique to each individual, much like our fingerprints. I felt a quiet excitement as I peered at the ridges along the fish’s side and watched the animal’s tail sway back and forth. 3. Take it all in. Swimming with whale sharks is exhilarating, joyful and special. While under water observing one of these marine giants, I kept reminding myself to take a moment to truly absorb the experience. These lone roamers are ancient and unique; they remind me of the amazing diversity in nature and the importance of protecting our planet and the wildlife within. I’m incredibly fortunate to have spent time up close with one of nature’s most wonderful creatures.